by Betty Huffman in Entertainment Tags: DALLAS, Entertainment, Ewing, J. R. Ewing, Larry Hagman, Programs, Television, TNT, Who shot J.R. Ewing? If you were a DALLAS fan back in the day when DALLAS was the number one show on television, then you know that tonight is the show to top all DALLAS shows. 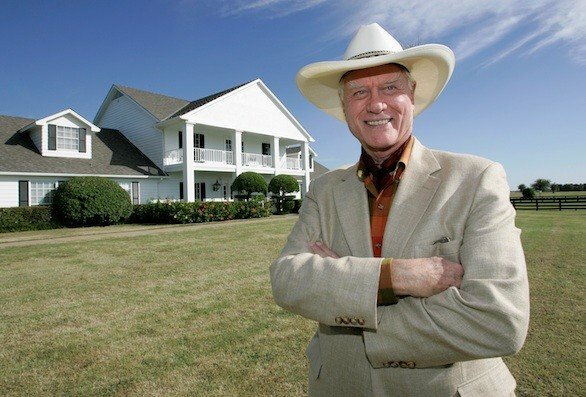 Tonight is the funeral of J. R. Ewing and TNT honors the actor Larry Hagman and the character he played so well for so many years – J. R. Ewing. J. R. Ewing…..the man on television that we all loved to hate. Larry Hagman played the infamous character from 1978- 1991. When the show first started, I was in my mid-twenties, and I can remember thinking that the series wouldn’t last long because people wouldn’t be interested in the complicated and sometimes crooked wheelings and dealings of an oil company and such a devious character. Boy! Was I wrong! The show managed to keep our interest through many years with business deals (legitimate as well as crooked), numerous affairs, family dinners and breakfasts, yearly South Fork rodeos, the Oil Barons’ Balls, divorces, marriages, re-marriages (I think the Ewings started the trend of re-marrying your ex-spouse! ), and even one whole season that was written off as all just a dream! I borrowed the complete set of DVDs of the original series from a friend and have been watching all the old episodes since some time last summer. I’m on season nine now and have five more seasons to watch along with the movie collection. I remember a lot of the plots, but there are many storylines and plot twists that I had forgotten. However, there is one thing that has totally blown me away. I am amazed at Larry Hagman’s brilliant portrayal of J. R. Ewing. He most definitely was a better actor than he was ever given credit for. And that wicked smile! Larry Hagman perfected that look and there will never be another actor who can smile that wicked smile with such finesse, guile, and cunning. John Ross (Josh Henderson) will definitely have to work on whatever is going to be his “trademark look” when he has just manipulated people into a crooked deal. So far, his smile is absolutely NO match to that of J. R.’s!! I was an avid fan of the original DALLAS series, and I was excited when TNT announced they were bringing the series back with the second generation of Ewings. I was skeptical that they would be able to pull off the resurrection of such a successful series. However, with the inclusion of some of the original cast, particularly in the first few episodes, and some fantastic writers, I think they have done a superb job of integrating the old series into the new series and updating Ewing Oil to Ewing Energies. Thus far, each episode has built on the “Ewing feud” and entertained viewers with intriguing plot twists, new characters, and surprises. What a way to end the first season of the new DALLAS with revealing that Christopher’s new wife, who is pregnant with twins and whom he is already separated from, is actually Cliff Barnes’s daughter (WHOA!….I didn’t see that one coming)! Tonight’s episode of DALLAS will pick up where last week left off. John Ross was on the phone with J. R., who is away on business, discussing their next moves to take over Ewing Energies. The conversation is interrupted by footsteps heard by John Ross followed by two shots. There is no response from J. R. when John Ross yells into the phone, “J. R.? Hello? Dad! DAD! Dad?” And once again, we, the viewers, are left wondering……”WHO SHOT J. R. Ewing? !” I will have my popcorn and soda ready! Will you join me and millions of other viewers?